There are many ways to stop smoking. Chewing gum, wearing patches, going to meetings, hypnosis - the list is endless. Did you ever believe that you could cut down on smoking by inhaling an electric cigarette? The future is now, and with a range of Twisp starter packs, you too can now invest in your future health. See below for a list of options, ranging from our Classic range to our new Dura-C range. Choose the package to suit your lifestyle and let Twisp reinvigorate your concept of smoking. The Dura Auto White is a suburb new addition to our range of devices. It is a fully automatic version of the Dura-C, and a grown up model of the exemplary Mini. It is a high capacity cigarette smoking device that delivers over 200 puffs per charge, as well as 250 puffs per cartridge. For having intensely realistic vapour producing capabilities and a long-lasting battery life, the Dura-C has remained a firm favourite with all lovers of Twisp. One of its secrets is the manual switch, an exclusive switch that preheats the atomiser, even before a puff is taken. Therefore, unlike any other device on the market, the Twisp Dura-C creates a high-quality vapour that will satisfy even the fussiest of smokers. The Classic Twisp Black is part of our stalwarts of personal inhalation devices that have satisfied customers the world over. Now, with an extended power kit (attached to either your car or a computer via USB), you can now enjoy long-lasting smoking satisfaction for hours on end. Our atomiser delivers the finest vapour, with the smoothest flavours. The Classic Twisp Titanium is the same model as our Classic Black. It delivers the same long-lasting smoking satisfaction, with 200-250 puffs per cartridge. It is our atomisers that set us apart from other products, as they produce an abundance of flavours. 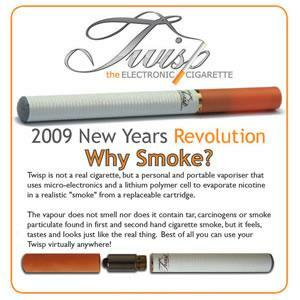 The Twisp Stick is our only product that does not resemble the conventional form of a cigarette. However, it makes up for this with a massive 320Mah battery that far outlasts our other products. The Stick is easy to hold and provides the same intense flavour as our other electronic cigarettes.